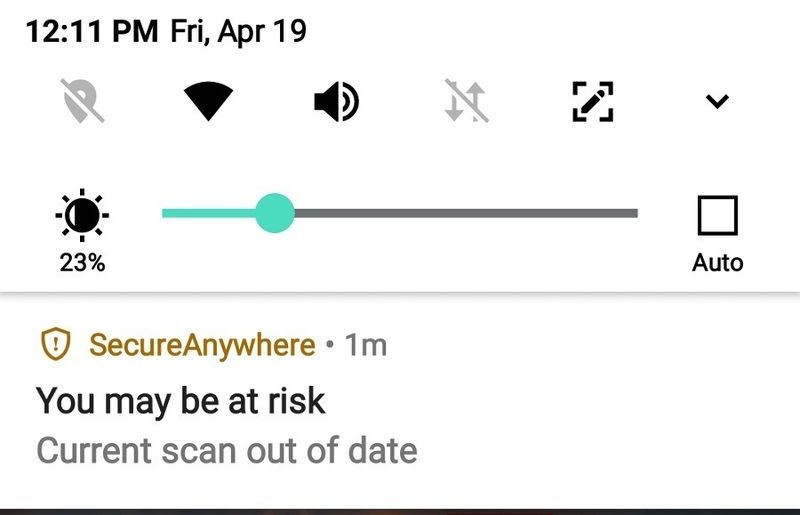 Are any of you seeing messaging in the Mobile Protection app that says "Scan out of date"? If so, would you mind posting screenshots here in the thread below? I've been getting it, tried restarting phone, updating app, etc. No luck. 3 days now. Hello @jaesun007 and Welcome to the Webroot Community! Can you please confirm the Build number that you are using? Is it v5.5.5.38499? Same message, same build number: v5.5.5.38499. Thanks, folks. I've given a link to this thread to our product team. Thank you, and if anyone else has this, please let us know. Interesting. My Samsung tablet does NOT have this problem. Same build 5.5.5.38499. Android 8.0.0. I am also receiving the same message and it's also the same build. I am having the same issue on my Samsung Galaxy Note 9 running Android v9. Same build number. Pixel 3 and TAB S2 no issues. Not sure this is the same issue but with the new 5.5.5.38 update my J7 still cannot schedule scans - when you choose security and then scan for viruses it does seem to run a scan but when finished it shows the page that lists all the services as "on" or "safe" but no ability to make changes/choose schedule. Unless I run it manually it seems it does not update. Prior version worked like a dream. really sorry I bought 2 years of this. Hello @kalandpsy and Welcome to the Webroot Community! 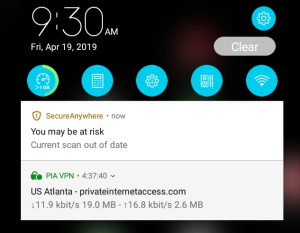 I see the same issue - constant notification that "you may be at risk. Current scan out of date" even tho scan was just run, definitions are up to date, latest webroot version 5.5.5 38449 is installed. Samsung note 8 sm-n950u1, android 9. This is no longer true. This morning I have the 'scan out of date' message. I noticed Tmoney 285 is using Webroot SecureAnywhere Mobile Premier. I am using Webroot SecureAnywhere Mobile Complete on 2 devices a Pixel 3 and TAB S2 and not having a an issue. If people posted which version they are using as the issue maybe product specific? Scan warning always present. I've cleared cache and scanned in various combinations but warning remains. Scanlog.txt file date and file contents stuck at April 4, 2019. I am having the same issue on my Samsung Galaxy 8. It started a couple days ago. Thank you everyone for the continued posts on this issue. We really appreciate it! This is pure speculation on my part I am wondering if the out of date scan message maybe due to a console issue? 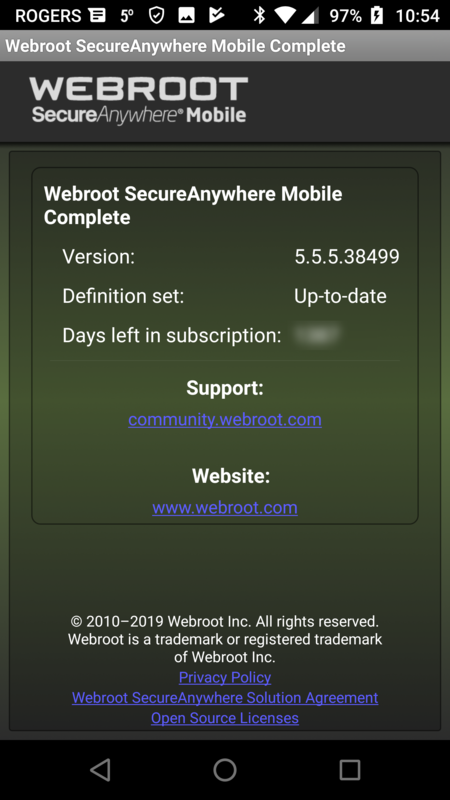 During the battery drain issue I uninstalled Webroot SecureAnywhere Mobile Complete from my Pixel 3 and TAB S2. I signed up for the Beta test program, installed the Beta software and my Pixel 3 was listed in my console and the TAB S2 would not show up. I tried lots of things, uninstalls, reinstalls and in the end I added a new email address to my console reinstalled with the new email address on both devices and moved the desktop pc to the new email address and everything has been fine. In another thread Shserjj posted that the scanning log file had not changed date, so if Webroot has changed how the software is communicating it's status and if the software cannot retrieve the information from the console data due to an a console issue it may be reporting an out of date scan?